I have a surefire way to bust your kids summer boredom today! 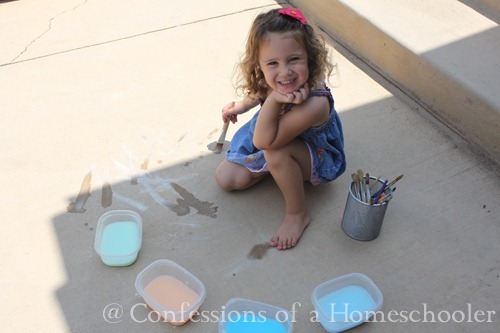 Can you say homemade sidewalk paint? Oh yes, who doesn’t love painting outside on the sidewalk? And the best part…no clean up for moms! Using paint brushes, decorate your driveway! Clean up: Bust out the hose and let the kids have fun spraying off the driveway and themselves! My daughter would love this. Thanks for the how-to! Too cool! Great idea! Posted it on FB. 🙂 Thanks! I just went out and did these with my 3 year old son and the little neighbor girl (7) and they both LOVED it!!! The texture of the paint is really cool and makes for some awesome pictures. They even had fun sprinkling the paint on the rocks around our sidewalk. It was a really fun boredom buster for sure! Thank you for sharing this fantastic idea.